Responsible for nearly half of the world’s total coal consumption— mainly to fire its power plants—China’s remarkable four-decade long economic expansion has been fueled in large part by coal. But choking air pollution, along with China’s commitments under the Paris Agreement on global warming, are pushing the country down a greener path. China produced 3.2 billion tons of coal in 2016, or 44 percent of the world’s total, according to the International Energy Agency, and it was also the top importer of coal. In 2016, coal plant capacity in China reached 942 gigawatts, up 42 GW from the previous year, according to China Electricity Council. The upshot: China accounted for 30 percent of the world’s carbon dioxide emissions that same year. But Beijing had already recognized the dangers of runaway coal consumption. In 2013, the government released the air pollution action plan, which led to a campaign to replace coal with natural gas. In December 2016, the National Development and Reform Commission established targets for renewable energy, including increasing the share of non-fossil fuel energy as a share of total primary energy consumption from 12 percent in 2015 to 20 percent by 2030. 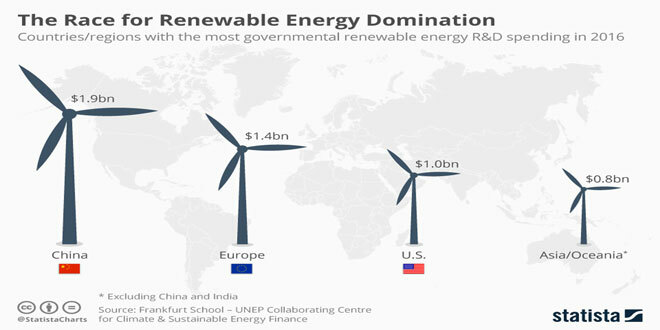 At the same time, manufacturing and development of renewable energy-related technology flourished, thanks to generous state backing, China is now a leader in this area and according to the IEA, Chinese companies boast about 60% of the world’s annual solar cell manufacturing capacity. Based on IEA data projection, China will account for over 40 percent of global renewable capacity expansion from 2018 to 2023. Wood Mackenzie estimates that renewables will account for nearly 20 percent of China’s power output in 2035, while coal will drop to less than 50 percent.